Resting alongside the roadway, a cyclops eyes you and your companions as you approach. 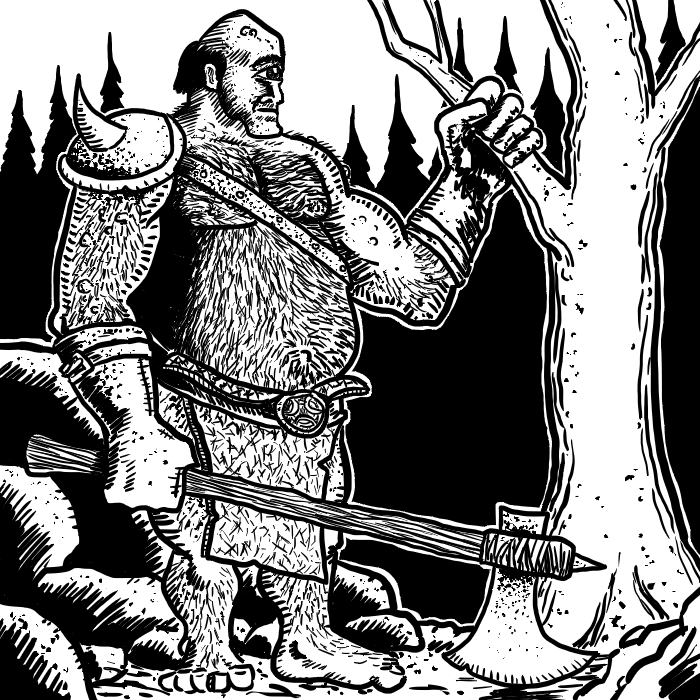 Raising an ax in greeting, the cyclops asks if you would like to purchase any firewood. What the creature things a band of adventurers needs with firewood is a question we’re best not asking the beast. The cyclops lives in caves nearby and is trying to fit in with the towns and villages of the area. It has an arrangement with many of the people, trading firewood for coins, food, or drink, but it has stocked most of the locals with enough firewood to get through the winter . . . and it still wants food and drink. If the party declines, the cyclops suggests that the party enter into business with the beast. The cyclops will provide a wagon, horse, and load of firewood if the group agrees to take the wood to the nearest city and exchange the wood for as much in the way of winter supplies as they can manage. The giant is willing to give the party 15% of the take. If they refuse the offer, the cyclops asks if he may join their group. Do you seek a solution to the cyclops’ problems and help to exchange the wood for provisions? Do you accept a new member into your adventuring party? How do you turn down a powerful creature without angering it and having it turn on you?